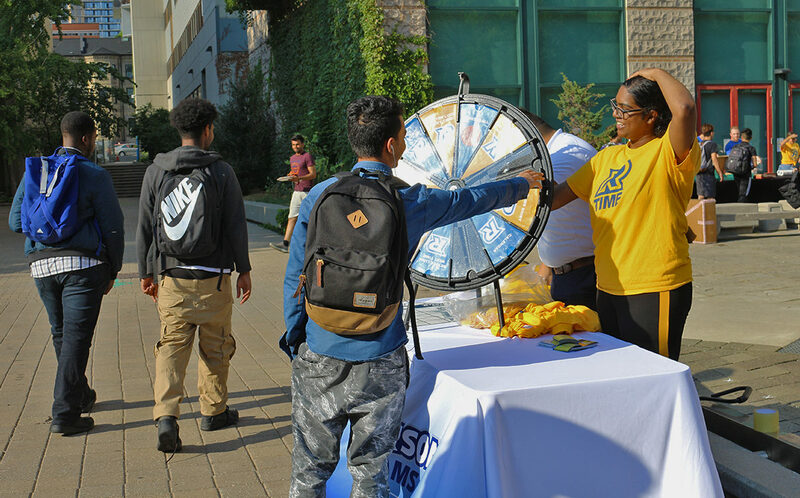 Every year, there are a few marquee Rams games that create a certain buzz on campus. These are the games that have fans pack the stands. There is a drastic difference in attendance between regular games and marquee games. For each regular game, the athletics department hopes to get around 200-300 students. 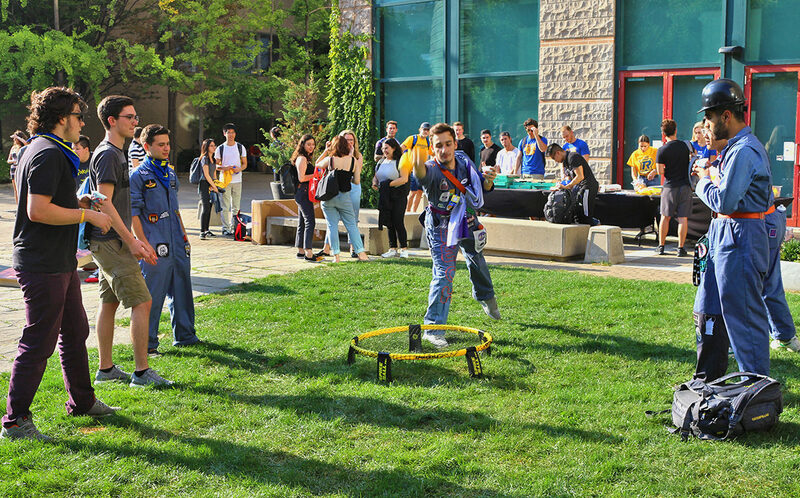 The goal for marquee games is to be in the range of 800-1000 students, if not more. The games are strategically scheduled based on when the games are in a given season and the competitiveness of the opponent. For the athletics department, there is also a bigger goal in mind with getting more students to attend games. Carm Federico is the director of sales and marketing for Ryerson Athletics. Federico’s work involves building student engagement for Rams varsity teams. “ … I want it to feel like the NCAA. We want that engagement. That’s our goal to get to,” said Federico. The National Collegiate Athletic Association (NCAA) is made up of college and university varsity teams across the United States. It’s known for traditionally attracting massive crowds and having popular television broadcasts internationally, especially for the college basketball tournament, March Madness. Ryerson is still ways away from achieving this, but the athletics department has strategies in place to attract that level of engagement. 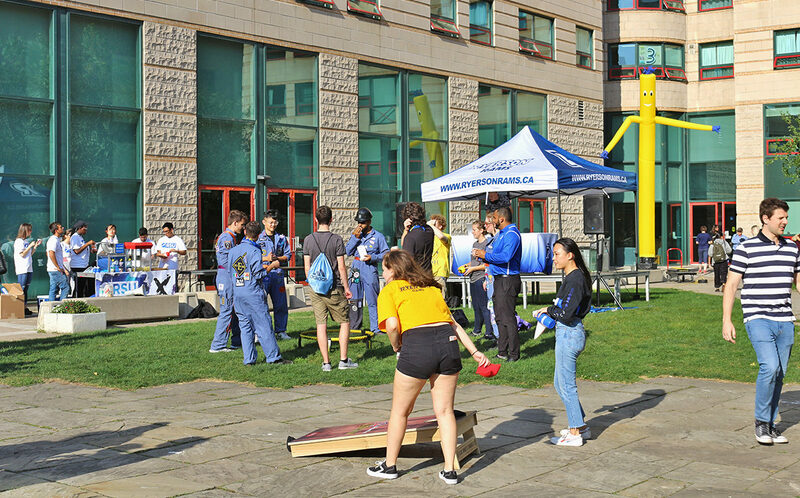 Earlier this semester, the department set up a table and tent on Gould Street for orientation week to speak to students about the marquee varsity games. They also do this on other days of the school year leading up to the games. 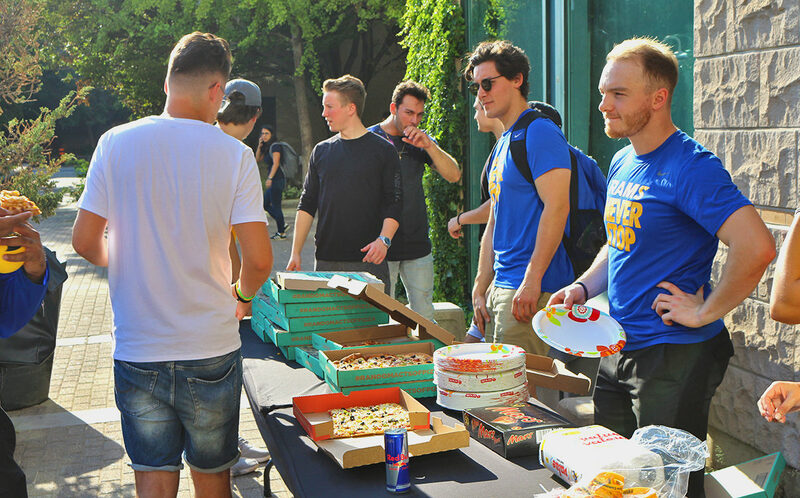 There is often a tailgate party to get students together before the game. Most recently, there was one on Sept. 21 for a men’s hockey exhibition game against the University of New Brunswick. The tailgate included a DJ, snow cones, pizza, sign making, games, and other activities. This hockey game was used as a good warm-up to build momentum and get students engaged for the Oct. 3 home opener. The tailgate was moved from its usual spot on Gould Street to Pitman. Federico said being at Pitman works better to create more Rams fans. 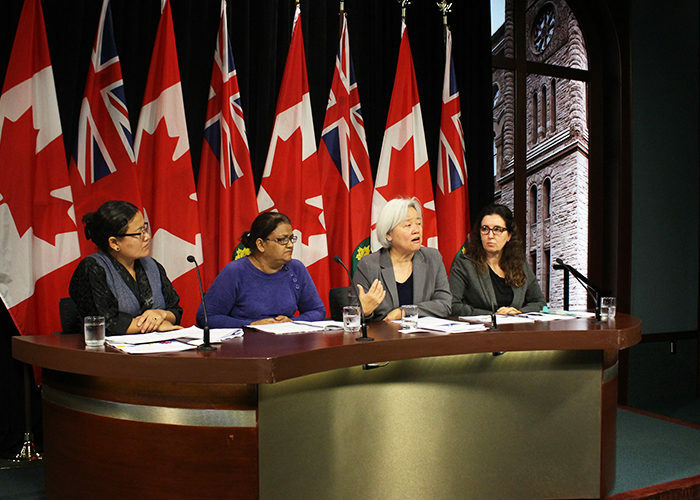 “We really need to be around residence … I’m hoping we can really engage those first years because then it becomes easier to get them out second, third and fourth year,” said Federico. Federico has spoken to other schools such as York University, Brock University and University of Toronto to try and build rivalries that foster student engagement. 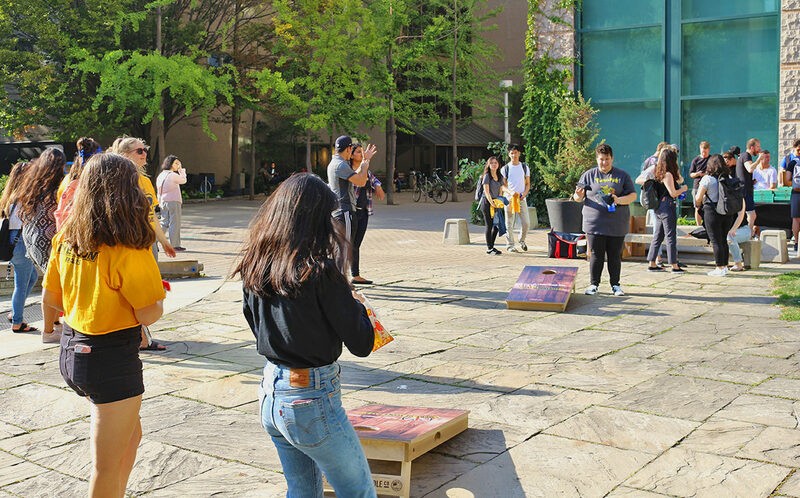 Carleton University and the University of Ottawa have also shifted to promoting marquee games. 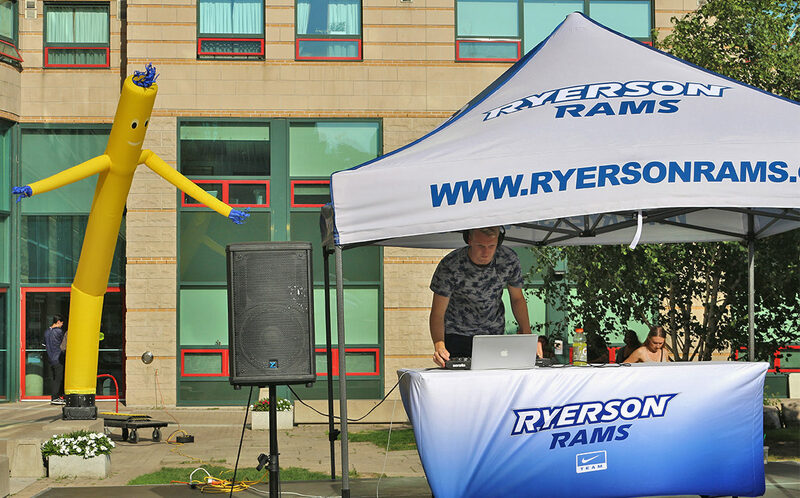 Some of the most die-hard Rams fans are part of Ryerson’s Ram Pack. 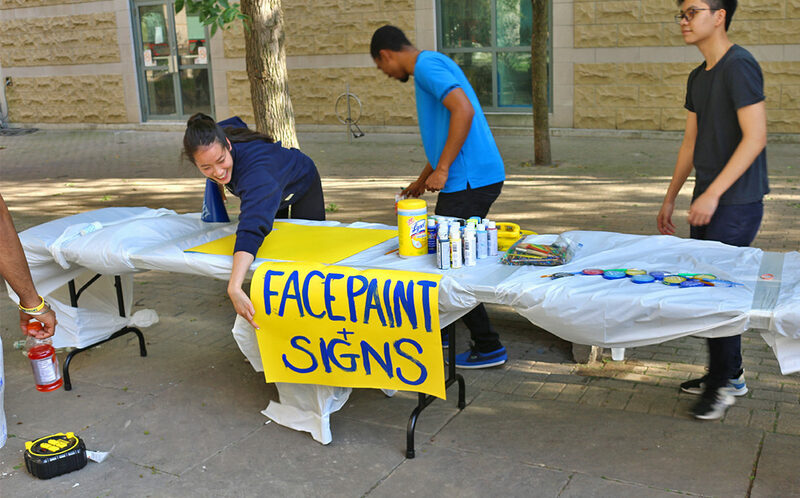 The Ram Pack, started in 2015, is a group of student fans who attend most Ryerson home games to cheer and support the varsity teams—some with horns, drums and body paint. They highlight the sort of spirit that NCAA fans have for their schools’ varsity teams. Adrian Garcea is in his fourth year as a member of the Ram Pack. He has noticed a difference in engagement since his first year. The Ram Pack has won the Ontario University Athletics (OUA) Best Fan Support Group award twice in the last three years. Though no school can win twice in a row, Garcea hopes to force the OUA’s hand and give Ryerson another award this year. At the U Sports national championship, which is often televised by Sportsnet, Garcea tries to use the national broadcast to show those watching through their screens that Canadian university sports fans are just as die-hard as NCAA fans. He uses games against Brock University—a Rams’ rival—as an example of how OUA games can one day reach the spirit levels of NCAA games. “[Brock and Ryerson] have gone back and forth now for three years, us travelling to [each other]. The atmosphere at those games is absolutely insane. There’s non-stop chanting the entire game. It’s so much fun to be there and it’s so loud at game time,” said Garcea. Though a jump to NCAA level of engagement is not going to happen overnight, Federico and the athletics department are trying their best to move in that direction. “We can’t do all 50 games like NCAA does, but we can start small and build [engagement] bit by bit,” Federico said.